There is no viable animal model that recapitulates the anatomy and physiology observed in obstructive right- and left-side cardiac lesions in the human. However, advances in ultrasound technology have enabled earlier and more precise diagnosis of human fetal cardiac lesions; this technology has also enabled the field of congenital heart disease to gain greater understanding of the unique fetal hemodynamics and the mechanisms involved in the evolution of cardiac disease in utero. Given the now substantial body of knowledge regarding the fetal physiology and natural history of these lesions in utero and the success of balloon aortic and pulmonary valvuloplasty in preventing or reversing new-onset ventricular dysfunction postnatally in infants, there is a theoretical rationale for intervention to relieve valvar stenosis in fetal life. There is also a physiologic and practical argument for enlarging the atrial septal communication in fetuses with restrictive interatrial septum and left atrial hypertension, who will otherwise have prenatal pulmonary abnormalities and postnatal instability due to a small or nonexistent interatrial communication. Intervention for cardiac defects fits into existing fetal care structures  and is an extension of services and clinical research protocols related to fetal treatment. However, it is still largely considered an adjunct to optimal postnatal management and does not obviate the need for further intervention after birth. Owing to the complications of any intrauterine intervention, investing in innovative fetal treatment can be considered a useful exercise only when it is made feasible in terms of procedural ease and risks. Experimental studies on open fetal cardiac surgery began in the 1980s in animal models to study the physiologic and pathologic mechanisms of extracorporeal circulatory bypass. Although initial research showed promise of reproducibility in technique, the fetoplacental response to bypass, characterized by an end result of fetal hypoxia and demise, deterred complete success. Factors contributing to placental dysfunction following a time on bypass appeared to be multiple, with reports of cytokine-mediated injury evidenced by the increase in prostanoids, vasoactive leukocytes, complement, and consequent endothelial dysfunction. [3, 4, 5, 6] Maternal placental dysfunction also followed owing to an increase in vascular resistance, and a relative state of fetal hypoxia ensued as a consequence of the impairment in fetal blood flow. [7, 8, 9] As a result, fetal open cardiac surgery was largely abandoned. Reports of clinical developments from the largest series of these procedures confirm technical success and reproducibility. [15, 16] They also suggest that successful fetal procedures lead to improvement in functional chamber development and myocardial function while the fetus is still in utero. It is also possible that the intrauterine environment is naturally conducive to wound healing and regeneration at a cellular level. However, much effort must be applied to appropriate planning and selection of candidates (both maternal and fetal) to minimize the obvious complications and risks associated with in-utero interventions. Appropriate patient selection involves evaluation not only of the fetal cardiac defect but also of the maternofetal aspect and the pregnancy as a whole. Given that these defects have a spectrum of severity and usually progress during gestation, the ideal time to treat them is before any additional insult is incurred. Therefore, the ideal gestational age is when the patient meets criteria and as soon as possible. These defects also have significant differences in their disease progression. Aortic stenosis clearly has a degree of severity at which there is a point of no return in terms of evolution to HLHS. In contrast, in pulmonary atresia with intact ventricular septum, the right ventricle may have more capacity to remodel (based on observations in postnatal patients) and likely does not incur as much myocardial damage in utero, for unknown reasons. The ideal gestational age for treatment is therefore between 18 and 30 weeks’ gestation for aortic stenosis, with 22-30 weeks preferred for pulmonary valve procedures and up to 34 weeks preferred for an atrial septal procedure in the presence of left heart obstruction. Initially, the fetal cardiac defect and the potential for successful alteration of the fetal anatomy and physiology in such a way as to achieve the goal of the intervention (viable left or right ventricle in aortic stenosis or pulmonary atresia; left atrial decompression in restrictive or intact atrial septum) should be critically evaluated by an experienced physician team, including pediatric/fetal cardiologists. Specific suggested criteria for aortic valvuloplasty in the fetus were published in 2011  and were reevaluated in 2017 at the same center  ; however, criteria for intervention in pulmonary atresia and atrial septal restriction are less clear, and none exist for fetal pacing (though a clinical trial with a prototype device is in the planning stages). Additionally, a detailed ultrasound examination should be performed to exclude other fetal anomalies and to define placental location, cervical length, and uterine or adnexal masses that could influence the safety and technical aspects of the procedure. A thorough evaluation of the maternal health and obstetric history should be undertaken by an experienced maternofetal medicine specialist to rule out any absolute contraindications to maternal anesthesia or the procedure itself and to disclose any potential relative contraindications that would have to be discussed prior to proceeding. When feasible, the proposed procedure should also be discussed with the referring obstetrician/perinatologist who will be caring for the patient after the procedure. All patient counseling is preferably done with the partner or support person(s) present, and every effort should be made to ensure that there is an understanding of the issues regarding the procedure’s safety and efficacy for both the pregnant woman and the fetus. The clinicians are required to provide patients with clear verbal and (if required by local oversight agencies) written information and with counseling and support both before and after the procedure. Patients who do not demonstrate a clear understanding of the potential risks and uncertain long-term benefit of these procedures should be considered incapable of providing informed consent and should not be considered candidates for fetal intervention. Fetal aortic stenosis at 20 weeks' gestation. Left ventricle is dilated, and ventricular function is poor, because of severe obstruction of aortic valve. Same fetus as in previous video, now at 34 weeks' gestation, with evolving hypoplastic left heart syndrome due to aortic stenosis present earlier in gestation. Left ventricle is now small, is echo-bright, and shows no systolic contraction. The first reported successful series of per-ventricular fetal aortic valvuloplasty to halt the evolution of HLHS in fetuses with aortic stenosis from a single center was published by Tworetzky et al in 2004. Of the 20 pregnancies in which this procedure was performed, 14 (70%) cases were technically successful, with 21% of fetuses subsequently achieving biventricular circulation after birth. Interestingly, this group also reported the natural history in a control group of affected pregnancies wherein intervention was offered but declined. In this observational cohort, all fetuses developed hypoplasia of the left side requiring single-ventricle palliation by term. With growing experience in fetal cardiac catheter-based interventions and modifications of the technique, a larger series of treated pregnancies (including the original cases) was reported 5 years later. Of the 68 fetuses who underwent aortic balloon valvuloplasty, 15 (22%) went on to have a successful biventricular outcome as neonates. In the last 50 cases, the success rate was 31% (27% as neonates, with an additional 4% converted to a biventricular circulation at a later stage in their palliation). Another group from Linz, Austria, reported that as many as 43% of fetal aortic stenosis cases treated with successful prenatal intervention led to biventricular circulation after birth, with 67% of live-born technical successes being biventricular. Other factors (eg, older gestational age at the time of intervention and, perhaps, less severe left ventricular dysfunction at the time of the procedure) may have influenced the higher success rates seen in this series in comparison with the initial Boston series. The authors were able to assign high, intermediate, and low likelihood of biventricular outcome to patients on the basis of their retrospective data. Postnatal evaluation confirms that the newer aggressive valvar reparative strategies and resection of endocardial fibroelastosis have resulted in sufficient left ventricular rehabilitation to yield a functional biventricular circulation. [32, 35] The longer-term outcome of these patients, however, is still to be determined. 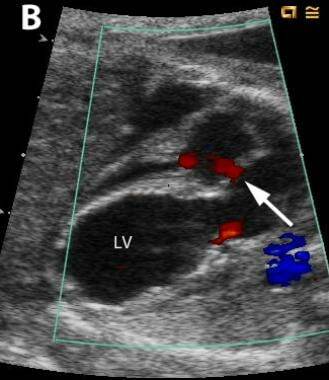 Fetus with severe aortic stenosis and left-to-right blood flow by color Doppler through foramen ovale (arrow). Sagittal image of fetus with severe aortic stenosis. 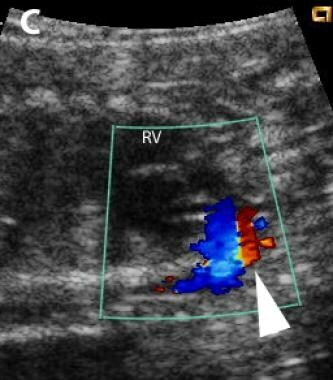 Aortic arch is filling retrograde in systole, as evidenced by color Doppler, with normal antegrade flow (blue) in ductal arch and retrograde flow (red) in aortic arch. Appropriate patient selection is critical. It is now appreciated that left ventricular myocardial disease associated with endocardial fibroelastosis can also result from infection, maternal autoantibodies, and other less common etiologies, which may be difficult to distinguish from aortic stenosis as the primary cause (see the images below). [38, 28, 27] . Endocardial fibroelastosis: gross anatomy. Image courtesy of Phil Ursell, MD, Department of Pathology, University of California, San Francisco, School of Medicine. 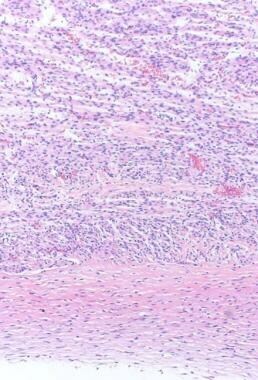 Endocardial fibroelastosis: histopathology. Image courtesy of Phil Ursell, MD, Department of Pathology, University of California, San Francisco, School of Medicine. Considerable further effort must be applied to modeling myocardial structure and function in healthy, treated, and untreated groups so as to help define and elucidate any distinguishing features that may improve patient selection. Clinical functional outcomes appear to be influenced not only by the degree of hypoplasia alone but also by the degree of mitral valve disease, aortic hypoplasia, and the degree of endocardial fibroelastosis of the left ventricle. 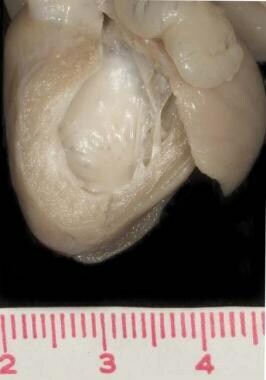 Fetal hypoplastic left heart syndrome with intact interatrial septum. Note thickened, bulging interatrial septum with left atrial hypertension evidenced by pulmonary vein dilation. As early results revealed a gestational age–related exponential diminution in the size of these defects, it has been suggested that improved longer-term patency might be achieved by using coronary artery stents. The authors’ conclusion is that altered pulmonary venous Doppler patterns with only forward flow in ventricular systole and reversed flow in atrial systole are more likely to be associated with critical cyanosis after delivery, making the performance of atrial septoplasty a true emergency requirement, whereas the presence of even a small amount of forward flow in early diastole may identify the fetus in whom intervention may not be necessary for several hours to days, if at all. This raises an interesting question: Would fetal intervention then be justified even in patients who were expected to be stable in the neonatal period? Clearly, more investigation into this area and the development of animal models of left atrial hypertension may help shed light on the optimal timing of intervention and the potential for reversal of vascular changes that may improve longer-term outlook for these single-ventricle patients. Fetal intervention for severe right ventricular outflow obstruction via transthoracic per-ventricular balloon pulmonary valvuloplasty has also been attempted. The role of intervention is to promote right heart functional development and to improve the possibility of postnatal biventricular circulation (see the video below). Fetal pulmonary atresia with intact ventricular septum. Right ventricle is small and hypertrophied at 27 weeks, with tricuspid valve size 3 standard deviations below normal for gestational age. This would represent borderline candidate for fetal procedure, as success with postnatal therapy alone is likely. Identification of potential candidates is generally based on the risk of progression to univentricular circulation if left untreated, though this risk is less well defined for fetuses with right heart obstruction than for those with aortic valve obstruction. Reviews of the evolution of severe pulmonary outflow tract obstruction have shown that a preprocedure tricuspid valve annulus dimension of more than 3 standard deviations below gestational age–based normal values and diminutive size of the pulmonary valve and the outflow [47, 48, 49, 46] are more likely to be associated with evolution of right heart hypoplasia sufficient to preclude biventricular circulation at birth despite aggressive postnatal intervention. This should guide future attempts at fetal pulmonary valvuloplasty. Therefore, although technical success is possible for fetal aortic and pulmonary valvuloplasty and atrial septoplasty, further work is needed before these techniques are widely adopted, in part because of the rarity of the lesions for which intervention would be warranted. Ideally, randomized multicenter trials that include long-term follow-up of patients who have undergone these procedures will provide the most definitive conclusions as to efficacy, safety, and superiority over current palliative pathways that include only postnatal interventions. Given the rarity of the fetal disease, however, issues related to the cost and feasibility of such trials may continue to be prohibitive in the current medical climate. In most cases associated with a structurally normal heart, maternal autoantibodies are present in the maternal serum. The mothers may not show clinically apparent symptoms of lupus or Sjögren syndrome; however, in both, transplacental passage of the antibodies can potentially cause inflammation and fibrosis at the atrioventricular (AV) node in particular. A few isolated investigators over the past two decades have attempted treatment to increase ventricular rates in the face of hydrops and imminent demise of the fetus in the form of implantation of fetal pacemakers. [56, 57] The results appeared mixed, with some reporting initial good results, with complete resolution of hydrops and achievement of normal heart rates. Theoretically, this approach should provide relief in the gestational period wherein the insult is the most severe, prolonging pregnancy and promoting feasibility of early postnatal permanent pacemaker implantation. However, to date, no survivors following institution of fetal pacing have been reported. Previous approaches have relied on the placement of an epicardial pacing lead on the fetal heart with an extrauterine pulse generator implanted in the maternal abdomen, with failure attributed to lead dislodgment due to fetal movement. A prototype device that is delivered via a transcatheter technique may be more promising and is currently in preclinical testing. Owing to the lack of information regarding successful performance of this procedure, this approach is not discussed further in this article. Although it is evident that technical success is possible for fetal aortic and pulmonary valvuloplasty and atrial septoplasty, universal adoption of in-utero treatment for all fetuses is not appropriate. There are geographical and economic considerations owing to the complexity of planning involved. The level of care both in the obstetric environment and for neonatal cardiac intensive care may not be available at all institutions. Currently, the practice of neonatal cardiac surgery is confined to a few institutions that have invested a great deal of time and effort in research, development, and refinement of technical expertise in this area. In addition, much remains to be learned about the benefits and potential adverse effects of intervention. The use of these procedures is also complicated by technical issues related to fetal positioning, stabilization, and the need for high-fidelity continuous imaging by specially trained personnel with experience in ultrasound guidance of invasive procedures. There are equipment-related limitations, including imaging artifacts caused by the materials used to manufacture the needles, wires, and catheters, exacerbated by the diminutive sizes of the cardiac structures being imaged. Because of the relatively recent development of these procedures, there is also a paucity of data regarding their long-term outcomes; reliable outcome data are vital if such interventions are ever to become routine in clinical practice. Ideally, for all forms of intrauterine cardiac intervention, randomized multicenter trials with long-term follow-up would provide the most definitive conclusions as to their efficacy, safety, and superiority over current palliative pathways that include only postnatal interventions. To date, limited clinical data have not shown significant improvements in terms of functional or neurodevelopmental status [33, 59] ; however, the numbers are small. Without long-term data, it is not possible to address the ethical dilemma posed by weighing the risks of fetal intervention against the current surgical success rate of 95% that some centers have achieved in postnatal Norwood stabilization procedures. [60, 61, 62] The intrinsic risks to both mother and fetus associated with in-utero procedures may thus be too high to allow advocacy of routine fetal cardiac intervention until more information about long-term functional and neurodevelopmental outcome is available. Generally, nonsurgical cardiac therapies (including pharmacologic treatments) for the management of fetal tachyarrhythmias and bradyarrhythmias are better established than in-utero interventions and much more amenable to universal adoption, in that they avoid the risks uterine interventions invariably carry. Nevertheless, it is indisputable not only that fetal cardiac intervention is possible but also that giant strides have already been made toward establishing technical expertise in this area, even though routine clinical application outside a few highly specialized centers is still far off. The therapeutic utility and staying power of fetal cardiac intervention depend on a host of critical issues. Clinical and research efforts must focus on enhancing our understanding of the natural history of these conditions, as well as our ability to predict the myocardial response to invasive fetal intervention, so as to improve patient selection and increase the risk-benefit ratio beyond its current state. Education with a focus on earlier diagnosis of congenital heart disease and timely appropriate referral to centers capable of performing the interventions will be key. In view of the relative rarity of these fetal congenital heart conditions, more collaborative effort [23, 16] is necessary in order to improve our procedural techniques and to achieve an acceptable safety level for both the mother and fetus. It is also essential to continue efforts to improve equipment technology for diagnostic imaging and in the procedure room. One potentially important advance may come in the form of sophisticated robot-guided fetal cardiac intervention. Fetal therapy for congenital heart conditions is an area that holds great promise in the management of complex cardiac disease. Moon-Grady AJ, Baschat A, Cass D, Choolani M, Copel JA, Crombleholme TM, et al. Fetal Treatment 2017: The Evolution of Fetal Therapy Centers - A Joint Opinion from the International Fetal Medicine and Surgical Society (IFMSS) and the North American Fetal Therapy Network (NAFTNet). Fetal Diagn Ther. 2017 May 23. [Medline]. Turley K, Vlahakes GJ, Harrison MR, Messina L, Hanley F, Uhlig PN. Intrauterine cardiothoracic surgery: the fetal lamb model. Ann Thorac Surg. 1982 Oct. 34(4):422-6. [Medline]. Sabik JF, Assad RS, Hanley FL. Prostaglandin synthesis inhibition prevents placental dysfunction after fetal cardiac bypass. J Thorac Cardiovasc Surg. 1992 Apr. 103(4):733-41; discussion 741-2. [Medline]. Fenton KN, Zinn HE, Heinemann MK, Liddicoat JR, Hanley FL. Long-term survivors of fetal cardiac bypass in lambs. J Thorac Cardiovasc Surg. 1994 Jun. 107(6):1423-7. [Medline]. Sabik JF, Heinemann MK, Assad RS, Hanley FL. High-dose steroids prevent placental dysfunction after fetal cardiac bypass. J Thorac Cardiovasc Surg. 1994 Jan. 107(1):116-24; discussion 124-5. [Medline]. Reddy VM, McElhinney DB, Rajasinghe HA, Rodriguez JL, Hanley FL. Cytokine Response to Fetal Cardiac Bypass. J Matern Fetal Investig. 1998 Mar. 8(1):46-9. [Medline]. Reddy VM, McElhinney DB, Rajasinghe HA, Liddicoat JR, Hendricks-Munoz K, Fineman JR. Role of the endothelium in placental dysfunction after fetal cardiac bypass. J Thorac Cardiovasc Surg. 1999 Feb. 117(2):343-51. [Medline]. Parry AJ, Petrossian E, McElhinney DB, Reddy VM, Hanley FL. Neutrophil degranulation and complement activation during fetal cardiac bypass. Ann Thorac Surg. 2000 Aug. 70(2):582-9. [Medline]. Reddy VM, Liddicoat JR, Klein JR, McElhinney DB, Wampler RK, Hanley FL. Fetal cardiac bypass using an in-line axial flow pump to minimize extracorporeal surface and avoid priming volume. Ann Thorac Surg. 1996 Aug. 62(2):393-400. [Medline]. Eibschitz I, Abinader EG, Klein A, Sharf M. Intrauterine diagnosis and control of fetal ventricular arrhythmia during labor. Am J Obstet Gynecol. 1975 Jul 1. 122(5):597-600. [Medline]. Carpenter RJ Jr, Strasburger JF, Garson A Jr, Smith RT, Deter RL, Engelhardt HT Jr. Fetal ventricular pacing for hydrops secondary to complete atrioventricular block. J Am Coll Cardiol. 1986 Dec. 8(6):1434-6. [Medline]. Maxwell D, Allan L, Tynan MJ. Balloon dilatation of the aortic valve in the fetus: a report of two cases. Br Heart J. 1991 May. 65(5):256-8. [Medline]. Kunisaki SM, Jennings RW,Fetal Surgery. J Intensiv Care Med, 2008, 23: 33-51. Cortes RA, Farmer DL. Recent advances in fetal surgery. Semin Perinatol. 2004 Jun. 28(3):199-211. [Medline]. Moon-Grady AJ, Morris SA, Belfort M, et al. for the International Fetal Cardiac Intervention Registry. International Fetal Cardiac Intervention Registry: A Worldwide Collaborative Description and Preliminary Outcomes. J Am Coll Cardiol. 2015 Jul 28. 66 (4):388-99. [Medline]. Tworetzky W, McElhinney DB, Marx GR, Benson CB, Brusseau R, Morash D. In utero valvuloplasty for pulmonary atresia with hypoplastic right ventricle: techniques and outcomes. Pediatrics. 2009 Sep. 124(3):e510-8. [Medline]. Arzt W, Wertaschnigg D, Veit I, Klement F, Gitter R, Tulzer G. Intrauterine aortic valvuloplasty in fetuses with critical aortic stenosis: experience and results of 24 procedures. Ultrasound Obstet Gynecol. 2011 Jun. 37(6):689-95. [Medline]. Rychik J, Rome JJ, Collins MH, DeCampli WM, Spray TL. The hypoplastic left heart syndrome with intact atrial septum: atrial morphology, pulmonary vascular histopathology and outcome. J Am Coll Cardiol. 1999 Aug. 34(2):554-60. [Medline]. Marshall AC, Levine J, Morash D, et al. Results of in utero atrial septoplasty in fetuses with hypoplastic left heart syndrome. Prenat Diagn. 2008 Nov. 28(11):1023-8. [Medline]. Gurtner GC, Werner S, Barrandon Y, Longaker MT. Wound repair and regeneration. Nature. 2008 May 15. 453(7193):314-21. [Medline]. Donofrio MT, Moon-Grady AJ, Hornberger LK, Copel JA, Sklansky MS, Abuhamad A, et al. Diagnosis and treatment of fetal cardiac disease: a scientific statement from the American Heart Association. Circulation. 2014 May 27. 129(21):2183-242. [Medline]. Oepkes D, Moon-Grady AJ, Wilkins-Haug L, Tworetzky W, Arzt W, Devlieger R. 2010 Report from the ISPD Special Interest Group fetal therapy: fetal cardiac interventions. Prenat Diagn. 2011 Mar. 31(3):249-51. [Medline]. Friedman KG, Sleeper LA, Freud LR, Marshall AC, Godfrey ME, Drogosz M, et al. Improved Technical Success, Postnatal Outcomes and Refined Predictors of Outcome for Fetal Aortic Valvuloplasty. Ultrasound Obstet Gynecol. 2017 May 22. [Medline]. Salomon LJ, Alfirevic Z, Audibert F, Kagan KO, Paladini D, Yeo G, et al. ISUOG consensus statement on the impact of non-invasive prenatal testing (NIPT) on prenatal ultrasound practice. Ultrasound Obstet Gynecol. 2014 Jul. 44 (1):122-3. [Medline]. Mäkikallio K, McElhinney DB, Levine JC, et al. Fetal aortic valve stenosis and the evolution of hypoplastic left heart syndrome: patient selection for fetal intervention. Circulation. 2006 Mar 21. 113(11):1401-5. [Medline]. Allan LD, Sharland G, Tynan MJ. The natural history of the hypoplastic left heart syndrome. Int J Cardiol. 1989 Dec. 25(3):341-3. [Medline]. Sharland GK, Chita SK, Fagg NL, Anderson RH, Tynan M, Cook AC. Left ventricular dysfunction in the fetus: relation to aortic valve anomalies and endocardial fibroelastosis. Br Heart J. 1991 Dec. 66(6):419-24. [Medline]. Hornberger LK, Need L, Benacerraf BR. Development of significant left and right ventricular hypoplasia in the second and third trimester fetus. J Ultrasound Med. 1996 Sep;15(9):655-9. Kohl T, Sharland G, Allan LD, Gembruch U, Chaoui R, Lopes LM. World experience of percutaneous ultrasound-guided balloon valvuloplasty in human fetuses with severe aortic valve obstruction. Am J Cardiol. 2000 May 15. 85(10):1230-3. [Medline]. McElhinney DB, Marshall AC, Wilkins-Haug LE, Brown DW, Benson CB, Silva V. Predictors of technical success and postnatal biventricular outcome after in utero aortic valvuloplasty for aortic stenosis with evolving hypoplastic left heart syndrome. Circulation. 2009 Oct 13. 120(15):1482-90. [Medline]. Emani SM, Bacha EA, McElhinney DB, Marx GR, Tworetzky W, Pigula FA. Primary left ventricular rehabilitation is effective in maintaining two-ventricle physiology in the borderline left heart. J Thorac Cardiovasc Surg. 2009 Dec. 138(6):1276-82. [Medline]. Freud LR, McElhinney DB, Marshall AC, Marx GR, Friedman KG, del Nido PJ, et al. Fetal aortic valvuloplasty for evolving hypoplastic left heart syndrome: postnatal outcomes of the first 100 patients. Circulation. 2014 Aug 19. 130(8):638-45. [Medline]. [Full Text]. McElhinney DB, Vogel M, Benson CB, Marshall AC, Wilkins-Haug LE, Silva V. Assessment of left ventricular endocardial fibroelastosis in fetuses with aortic stenosis and evolving hypoplastic left heart syndrome. Am J Cardiol. 2010 Dec 15. 106(12):1792-7. [Medline]. Moon-Grady AJ, Moore P, Azakie A. Ross-Konno and endocardial fibroelastosis resection after hybrid stage I palliation in infancy: successful staged left-ventricular rehabilitation and conversion to biventricular circulation after fetal diagnosis of aortic stenosis. Pediatr Cardiol. 2011 Feb. 32(2):211-4. [Medline]. [Full Text]. Berning RA, Silverman NH, Villegas M, Sahn DJ, Martin GR, Rice MJ. Reversed shunting across the ductus arteriosus or atrial septum in utero heralds severe congenital heart disease. J Am Coll Cardiol. 1996 Feb. 27(2):481-6. [Medline]. Gardiner HM, Kovacevic A, Tulzer G, Sarkola T, Herberg U, Dangel J, et al. Natural history of 107 cases of fetal aortic stenosis from a European multicenter retrospective study. Ultrasound Obstet Gynecol. 2016 Sep. 48 (3):373-81. [Medline]. Ahuja P, Sdek P, MacLellan WR. Cardiac myocyte cell cycle control in development, disease, and regeneration. Physiol Rev. 2007 Apr. 87(2):521-44. [Medline]. Vlahos AP, Lock JE, McElhinney DB, van der Velde ME. Hypoplastic left heart syndrome with intact or highly restrictive atrial septum: outcome after neonatal transcatheter atrial septostomy. Circulation. 2004 May 18. 109(19):2326-30. [Medline]. Taketazu M, Barrea C, Smallhorn JF, Wilson GJ, Hornberger LK. Intrauterine pulmonary venous flow and restrictive foramen ovale in fetal hypoplastic left heart syndrome. J Am Coll Cardiol. 2004 May 19. 43(10):1902-7. [Medline]. Chintala K, Tian Z, Du W, Donaghue D, Rychik J. Fetal pulmonary venous Doppler patterns in hypoplastic left heart syndrome: relationship to atrial septal restriction. Heart. 2008 Nov. 94(11):1446-9. [Medline]. Divanovic A, Hor K, Cnota J, Hirsch R, Kinsel-Ziter M, Michelfelder E. Prediction and perinatal management of severely restrictive atrial septum in fetuses with critical left heart obstruction: clinical experience using pulmonary venous Doppler analysis. J Thorac Cardiovasc Surg. 2011 Apr. 141(4):988-94. [Medline]. Vida VL, Bacha EA, Larrazabal A, Gauvreau K, Thiagaragan R, Fynn-Thompson F. Hypoplastic left heart syndrome with intact or highly restrictive atrial septum: surgical experience from a single center. Ann Thorac Surg. 2007 Aug. 84(2):581-5; discussion 586. [Medline]. Lowenthal A, Kipps AK, Brook MM, Meadows J, Azakie A, Moon-Grady AJ. Prenatal diagnosis of atrial restriction in hypoplastic left heart syndrome is associated with decreased 2-year survival. Prenat Diagn. 2012 May. 32(5):485-90. [Medline]. [Full Text]. Tulzer G, Arzt W, Franklin RC, Loughna PV, Mair R, Gardiner HM. Fetal pulmonary valvuloplasty for critical pulmonary stenosis or atresia with intact septum. Lancet. 2002 Nov 16. 360(9345):1567-8. [Medline]. Gardiner HM, Belmar C, Tulzer G, Barlow A, Pasquini L, Carvalho JS. Morphologic and functional predictors of eventual circulation in the fetus with pulmonary atresia or critical pulmonary stenosis with intact septum. J Am Coll Cardiol. 2008 Apr 1. 51(13):1299-308. [Medline]. Gomez-Montes E, Herraiz I, Mendoza A, Albert L, Hernandez-Garcia JM, Galindo A. Pulmonary atresia/critical stenosis with intact ventricular septum: prediction of outcome in the second trimester of pregnancy. Prenat Diagn. 2011 Apr. 31(4):372-9. [Medline]. Salvin JW, McElhinney DB, Colan SD, Gauvreau K, del Nido PJ, Jenkins KJ. Fetal tricuspid valve size and growth as predictors of outcome in pulmonary atresia with intact ventricular septum. Pediatrics. 2006 Aug. 118(2):e415-20. [Medline]. Roman KS, Fouron JC, Nii M, Smallhorn JF, Chaturvedi R, Jaeggi ET. Determinants of outcome in fetal pulmonary valve stenosis or atresia with intact ventricular septum. Am J Cardiol. 2007 Mar 1. 99(5):699-703. [Medline]. Rychik J, Szwast A, Natarajan S, Quartermain M, Donaghue DD, Combs J. Perinatal and early surgical outcome for the fetus with hypoplastic left heart syndrome: a 5-year single institutional experience. Ultrasound Obstet Gynecol. 2010 Oct. 36(4):465-70. [Medline]. Schmidt KG, Ulmer HE, Silverman NH, Kleinman CS, Copel JA. Perinatal outcome of fetal complete atrioventricular block: a multicenter experience. J Am Coll Cardiol. 1991 May. 17(6):1360-6. [Medline]. Eliasson H, Sonesson SE, Sharland G, et al. Isolated atrioventricular block in the fetus: a retrospective, multinational, multicenter study of 175 patients. Circulation. 2011 Nov 1. 124(18):1919-26. [Medline]. Jaeggi ET, Carvalho JS, De Groot E, et al. Comparison of transplacental treatment of fetal supraventricular tachyarrhythmias with digoxin, flecainide, and sotalol: results of a nonrandomized multicenter study. Circulation. 2011 Oct 18. 124(16):1747-54. [Medline]. Jaeggi ET, Fouron JC, Silverman ED, Ryan G, Smallhorn J, Hornberger LK. Transplacental fetal treatment improves the outcome of prenatally diagnosed complete atrioventricular block without structural heart disease. Circulation. 2004 Sep 21. 110(12):1542-8. [Medline]. Jaeggi ET, Silverman ED, Laskin C, Kingdom J, Golding F, Weber R. Prolongation of the atrioventricular conduction in fetuses exposed to maternal anti-Ro/SSA and anti-La/SSB antibodies did not predict progressive heart block. A prospective observational study on the effects of maternal antibodies on 165 fetuses. J Am Coll Cardiol. 2011 Mar 29. 57(13):1487-92. [Medline]. Liddicoat JR, Klein JR, Reddy VM, Klautz RJ, Teitel DF, Hanley FL. Hemodynamic effects of chronic prenatal ventricular pacing for the treatment of complete atrioventricular block. Circulation. 1997 Aug 5. 96(3):1025-30. [Medline]. Eghtesady P, Michelfelder EC, Knilans TK, Witte DP, Manning PB, Crombleholme TM. Fetal surgical management of congenital heart block in a hydropic fetus: lessons learned from a clinical experience. J Thorac Cardiovasc Surg. 2011 Mar. 141(3):835-7. [Medline]. Zhou L, Vest AN, Peck RA, Sredl JP, Huang X, Bar-Cohen Y, et al. Minimally invasive implantable fetal micropacemaker: mechanical testing and technical refinements. Med Biol Eng Comput. 2016 Dec. 54 (12):1819-1830. [Medline]. Laraja K, Sadhwani A, Tworetzky W, Marshall AC, Gauvreau K, Freud L, et al. Neurodevelopmental Outcome in Children after Fetal Cardiac Intervention for Aortic Stenosis with Evolving Hypoplastic Left Heart Syndrome. J Pediatr. 2017 May. 184:130-136.e4. [Medline]. Kipps AK, Feuille C, Azakie A, Hoffman JI, Tabbutt S, Brook MM. Prenatal diagnosis of hypoplastic left heart syndrome in current era. Am J Cardiol. 2011 Aug 1. 108(3):421-7. [Medline]. Atallah J, Dinu IA, Joffe AR, Robertson CM, Sauve RS, Dyck JD. Two-year survival and mental and psychomotor outcomes after the Norwood procedure: an analysis of the modified Blalock-Taussig shunt and right ventricle-to-pulmonary artery shunt surgical eras. Circulation. 2008 Sep 30. 118(14):1410-8. [Medline]. Emery SP, Kreutzer J, Sherman FR, Fujimoto KL, Jaramaz B, Nikou C. Computer-assisted navigation applied to fetal cardiac intervention. Int J Med Robot. 2007 Sep. 3(3):187-98. [Medline]. Moise KJ Jr, Carpenter RJ Jr, Deter RL, Kirshon B, Diaz SF. The use of fetal neuromuscular blockade during intrauterine procedures. Am J Obstet Gynecol. 1987 Oct. 157(4 Pt 1):874-9. [Medline]. Vogel M, Wilkins-Haug LE, McElhinney DB, Marshall AC, Benson CB, Silva V. Reversible ductus arteriosus constriction due to maternal indomethacin after fetal intervention for hypoplastic left heart syndrome with intact/restrictive atrial septum. Fetal Diagn Ther. 2010. 27(1):40-5. [Medline]. Simpson JM. Fetal cardiac interventions: worth it?. Heart. 2009 Oct. 95(20):1653-5. [Medline]. Golombeck K, Ball RH, Lee H, Farrell JA, Farmer DL, Jacobs VR. Maternal morbidity after maternal-fetal surgery. Am J Obstet Gynecol. 2006 Mar. 194(3):834-9. [Medline]. Wohlmuth C, Tulzer G, Arzt W, Gitter R, Wertaschnigg D. Maternal aspects of fetal cardiac intervention. Ultrasound Obstet Gynecol. 2014 Nov. 44 (5):532-7. [Medline]. Kalish BT, Tworetzky W, Benson CB, Wilkins-Haug L, Mizrahi-Arnaud A, McElhinney DB, et al. Technical challenges of atrial septal stent placement in fetuses with hypoplastic left heart syndrome and intact atrial septum. Catheter Cardiovasc Interv. 2014 Jul 1. 84 (1):77-85. [Medline]. Assad RS, Zielinsky P, Kalil R, Lima G, Aramayo A, Santos A. New lead for in utero pacing for fetal congenital heart block. J Thorac Cardiovasc Surg. 2003 Jul. 126(1):300-2. [Medline]. Eghtesady P, Sedgwick JA, Schenbeck JL, Lam C, Lombardi J, Ferguson R, et al. Maternal-fetal interactions in fetalcardiac surgery. Ann Thorac Surg. 2006. 81:249-255; discussion 255-246. Friedman DM, Kim MY, Copel JA, Llanos C, Davis C, Buyon JP. Prospective evaluation of fetuses with autoimmune-associated congenital heart block followed in the PR Interval and Dexamethasone Evaluation (PRIDE) Study. Am J Cardiol. 2009 Apr 15. 103(8):1102-6. [Medline]. Friedman KG, Margossian R, Graham DA, Harrild DM, Emani SM, Wilkins-Haug LE. Postnatal left ventricular diastolic function after fetal aortic valvuloplasty. Am J Cardiol. 2011 Aug 15. 108(4):556-60. [Medline]. Hanley FL, Sade RM, Blackstone EH, Kirklin JW, Freedom RM, Nanda NC. Outcomes in neonatal pulmonary atresia with intact ventricular septum. A multiinstitutional study. J Thorac Cardiovasc Surg. 1993 Mar. 105(3):406-23, 424-7; discussion 423-4. [Medline]. Hasan BS, Keane JF, Tworetzky W, Lock JE, Marshall AC. Postnatal angiographic appearance of left ventricular myocardium in fetal patients with aortic stenosis having in-utero aortic valvuloplasty. Am J Cardiol. 2009 Nov 1. 104(9):1271-5. [Medline]. Hirsch JC, Copeland G, Donohue JE, Kirby RS, Grigorescu V, Gurney JG. Population-based analysis of survival for hypoplastic left heart syndrome. J Pediatr. 2011 Jul. 159(1):57-63. [Medline]. Kitano Y, Flake AW, Crombleholme TM, Johnson MP, Adzick NS. Open fetal surgery for life-threatening fetal malformations. Semin Perinatol. 1999 Dec. 23(6):448-61. [Medline]. Marshall AC, Tworetzky W, Bergersen L, McElhinney DB, Benson CB, Jennings RW. Aortic valvuloplasty in the fetus: technical characteristics of successful balloon dilation. J Pediatr. 2005 Oct. 147(4):535-9. [Medline]. Marshall AC, van der Velde ME, Tworetzky W, Gomez CA, Wilkins-Haug L, Benson CB. Creation of an atrial septal defect in utero for fetuses with hypoplastic left heart syndrome and intact or highly restrictive atrial septum. Circulation. 2004 Jul 20. 110(3):253-8. [Medline]. Padalino MA, Saiki Y, Tworetzky W, del Nido PJ. Pulmonary venous pathway obstruction from recurrent restriction at atrial septum late after Fontan procedure. J Thorac Cardiovasc Surg. 2004 Jan. 127(1):281-3. [Medline]. Rothman A, Galindo A, Evans WN. Temporary transumbilical stenting of the ductus venosus in neonates with obstructed infradiaphragmatic total anomalous pulmonary venous return. Pediatr Cardiol. 2011 Jan. 32(1):87-90. [Medline]. Kovacevic A, Roughton M, Mellander M, Öhman A, Tulzer G, Dangel J, et al. Fetal aortic valvuloplasty: investigating institutional bias in surgical decision-making. Ultrasound Obstet Gynecol. 2014 Nov. 44 (5):538-44. [Medline]. Galindo A, Gómez-Montes E, Gómez O, Bennasar M, Crispi F, Herraiz I, et al. Fetal Aortic Valvuloplasty: Experience and Results of Two Tertiary Centers in Spain. Fetal Diagn Ther. 2017 Apr 7. [Medline]. Guirado L, Crispi F, Masoller N, Bennasar M, Marimon E, Carretero J, et al. Biventricular impact of mild to moderate pulmonary valve stenosis in fetal life. Ultrasound Obstet Gynecol. 2017 Mar 10. [Medline]. Araujo Júnior E, Tonni G, Chung M, Ruano R, Martins WP. Perinatal outcomes and intrauterine complications following fetal intervention for congenital heart disease: systematic review and meta-analysis of observational studies. Ultrasound Obstet Gynecol. 2016 Oct. 48 (4):426-433. [Medline]. Percutaneous fetal balloon aortic valvuloplasty. Needle course is shown, with direct per-ventricular access to aortic valve. Fetal aortic stenosis. Intraoperative image illustrates needle trajectory that will afford access to left ventricle and aortic valve. Initial needle course must be precise; very little manipulation is possible once device has punctured left ventricle. Sequence during fetal aortic valvuloplasty: step 1 of 4. Needle has been passed through maternal abdomen and uterus and is preparing to enter fetal chest. Sequence during fetal aortic valvuloplasty: step 2 of 4. Needle puncturing left ventricle is aimed toward left ventricular outflow tract. Sequence during fetal aortic valvuloplasty: step 3 of 4. Wire is advanced through needle, across aortic valve, and well into ascending aorta. Sequence during fetal aortic valvuloplasty: step 4 of 4. Balloon is inflated, effectively dilating fetal aortic valve. Echocardiography is done immediately after procedure in fetus with aortic stenosis. Note forward flow across valve and in transverse aortic arch, with moderate aortic insufficiency, demonstrating successful valvuloplasty. Optimal fetal position and needle trajectory for atrial septoplasty. Right atrium is punctured through fetal chest, and needle is advanced through atrial septum, which is thickened and bows tensely into right atrium. Spectral Doppler traces in fetuses with (a) no restriction, (b) mild restriction, and (c) severe restriction at atrial septum, leading to left atrial hypertension. S and D waves associated with systolic and diastolic forward flow into left atrium and "A" wave reversal with atrial contraction are noted. Ratio of forward to reverse flow can be quantitated from these Doppler spectra as well (not shown).